More recent studies from the social sciences showed that “familiar ground may not be the best place to cultivate creativity.” Social scientist Adam Galinsky has found that people who have close relationships with someone from another country become more creative and score higher on routine creativity tests. Harvard economics professor Richard Freeman has an interesting study on diversity in science. He found that published scientific research receives greater attention if the authors are ethnically diverse. Starting with the premise of a cross-cultural partnership designed to promote creativity, we tried to take things even further and see what kind of results we get when we add cross-disciplinarity. The answer to the question posed in the title would be: “Yes, we do speak Tech…or at least, better than we did at the beginning of the European Theatre Lab (ETL).” The marriage between theatre and technology seems as complex as any real-life relationship and, in order to make it work, it needs pretty much the same ingredients: time, commitment, mutual trust, and a bit of love. It is not about two abstract worlds coming together here, but about people from different countries and cultures who did not know each other previously becoming a team and fighting for a shared goal. In the following text, I aim to point out both the main phases of ETL and the challenges that appeared along the way. Some brief conclusions and new perspectives of this collaborative way of working are also worthy of attention. 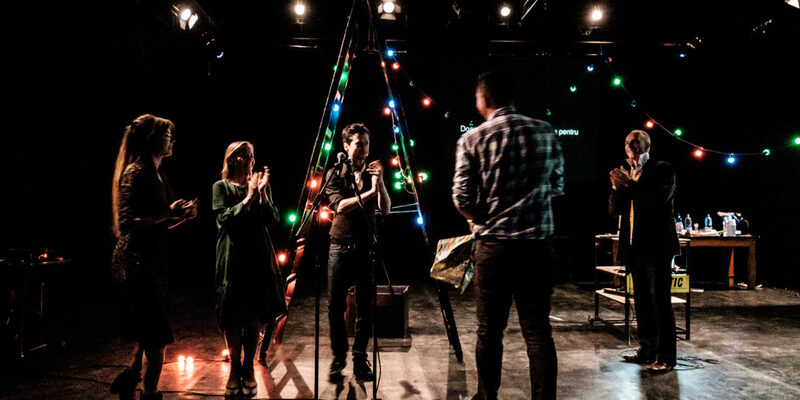 The task of Théâtre de Liège and Teatrul National “Marin Sorescu” Craiova (TNC) was to search for an innovative application of sound captioning for the performing arts based on a speech-to-text method. 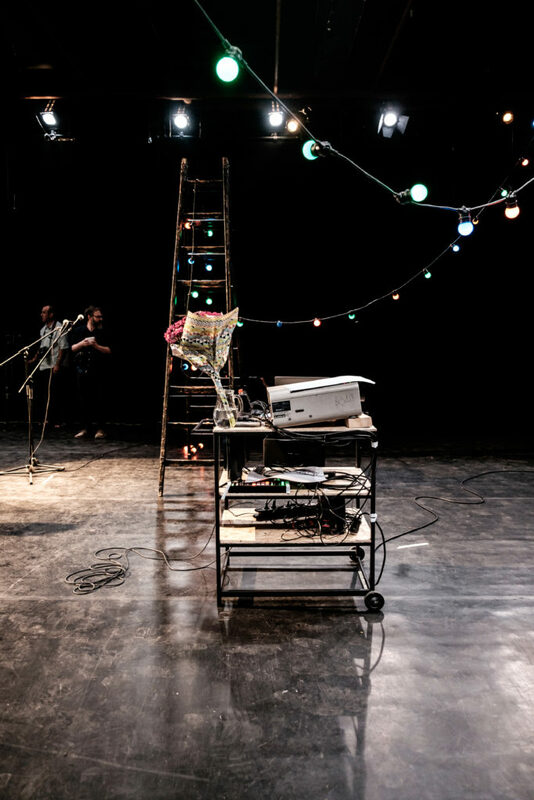 First, a microphone “hears” what the actor is saying live onstage, then a software transforms the sound transforms the sound into the text after it recognizes the spoken language, and matches it with the translated version using a pre-existing database. Then the translation is displayed for the audience on the classic surtitle screens we all know. The reasons for doing such a project may have been different in Craiova and Liège, but it is nevertheless the diversity of motives that proves the potential of this research. In Craiova, it is only on special occasions–during festivals or when on tour–that the shows are subtitled, so the usual costs for this feature are quite reduced. Since the city is not multicultural, the audience is mostly people who understand the language spoken onstage. At least at a first glance. But that is about to change! Craiova–the most important city in south-west Romania–is going through a process of a full economic development as it has started to attract foreign investors, international students and NATO armed forces: all potential new audiences. More than 150 years old, TNC is the only theatre in the city, so it has to satisfy the demanding cultural tastes of its audience. As an important cultural role in the region, TNC has to push its limits constantly in the artistic field. A good relationship with media innovations can be one of the reliable paths to follow. To cater to that, it is mandatory for the institution to improve its technical facilities as the theatre has not undergone any major renovations since its inauguration in the building in 1973. 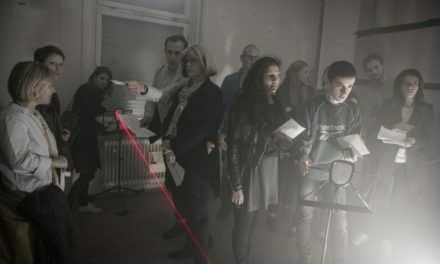 Projects like ETL can help it in two directions: first, to know better what kind of equipment it as an institution needs to acquire so that it can offer modern working conditions for the artists; and, second, to use them as advocacy tools in cooperation with the Romanian Ministry of Culture, which hands out subsidies by proving the interest in this direction. The goal was to make the innovative captioning device good enough to replace traditional subtitling methods–such as Glyph or the old Powerpoint slides and, most importantly, the human operator. MULTITEL and INCESA were invited to bring their know-how to the table and try to come up with technical solutions. The intermediate meetings between the partners–two OpenLabs and two partner meetings–along with different forms of online communication–email groups, Skype sessions–were meant to clarify the roles of the two research teams and the implementation phases of the app. The Belgian colleagues from MULTITEL–the sound specialists of the team–explained how they were planning first of all to “catch” the voice of the actors in real time and the results they were expecting. Artist input and the questions we asked were very useful at this phase: What is going to happen if for artistic reasons we cannot use a headset microphone, which proved to be the most efficient and simplest method? How can noises – like ambient music and audience–be filtered? How fast will the whole process be in order to avoid delays between the spoken line and the subtitle? And how will the app deal with the human error given the fact that actors might forget one or more lines or say it/them in an incomprehensible way? Unexpected delays in the research phase and different errors when simulating real conditions without pre-recorded samples of sound put the project on a different course and the team had to adapt. Romanian IT specialists who were supposed to integrate their partners’ results into software demanded a stricter schedule of activities with smaller and clearer milestones up through the bigger architecture of the project. Such a plan would have, in their view, made the process more transparent, less confusing and easier to evaluate in terms of costs, for example. In other words: How many people can we engage with the money we have within the specific time frame for solving the briefing? A rather interesting idea proposed by INCESA had to be left out: the development of a mobile app (for either Android or iOS operating systems) that could send the prompts as tweets to the theatre-goer in a friendly and discreet way during the show, with multiple languages options. By the end of the project, we realized that such an engine could have been developed using AI at different costs and on a larger horizon of time. For the moment, the live captioning can be done at a satisfactory level under specific conditions. 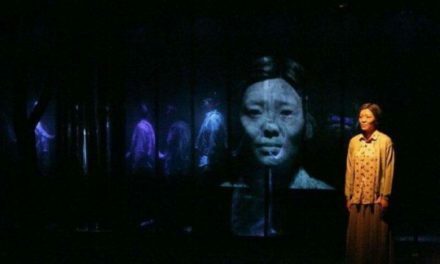 Transquinquennal, a Belgian theatre company comprising Miguel Decleire, Stephane Olivier, and Bernard Breuse, was commissioned by Théâtre de Liège to create a performance that integrated the results of the scientific research. Together with French playwright Marie Henry, they imagined Idiomatic, a show for five actors from five different countries, each speaking two languages: their mother tongue and a foreign language that is the native language of one of the other actors. The actors were Georg Peetz (a German), Andrej Zalesjak (a Slovenian), Anna Galy (a Belgian), Elisabeth Sand (a Norwegian) and me (Romanian). 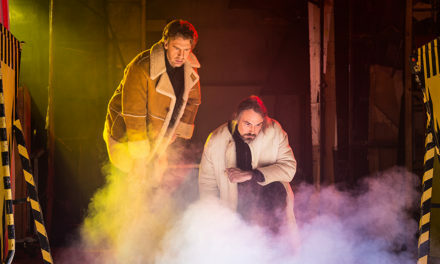 This proved to be a “recipe” for an extremely interesting production, as it had to sum up the confrontation between two very different theatrical systems and also include technology. 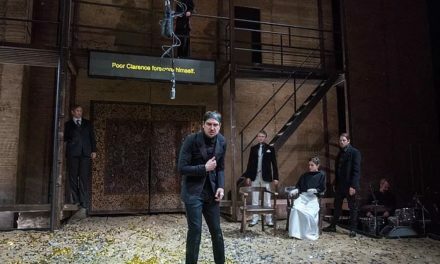 There were two stages of rehearsals: two weeks in Brussels and two more in Craiova where the premiere was held, with a gap of two months in between. This approach allowed the directors to test and re-evaluate their ideas and gave the actors time to become a team and co-create the show. Idiomatic was partially financed by the ETL, as the company used additional subsidies and called for theatre programmers to make sure that the show has it is on life, even after the end of the ETL project period. This is why Idiomatic will be performed not only in the partner countries but also in France and Luxembourg–and the list is still open. So, the collaboration of a state repertoire theatre like the one in Craiova – with its own house, specialized staff, technical infrastructure–and an independent extremely versatile and dynamic company can bring enormous benefits by reconsidering its mission as a provider of cultural goods and services. By also adding the technical part to the project, it all flourished. The principles of international and interdisciplinary projects like the ETL seem to have positive answers in practice. Institutions and companies that share financial resources can be proof of adaptability given the more frequent cuts in state subsidies, increased mobility of artists and productions, and the “mirroring” effect: by observing and getting to know the others better, you can understand yourself as an individual and an organization. On the other hand, one of the most difficult aspects of multicultural and multidisciplinary projects is that uniting such different perspectives under the same umbrella gives birth to a high degree of unpredictability that should be managed with more attention paid to time frames, and each person’s needs and possibilities. This could be done by deciding on the roles and responsibilities of each participant at the beginning of the project and sticking to those goals. Some questions still have to be asked if we want to find answers about the sustainability of such projects in the future: How are the grants invested and in which economies do they return? How much time can we as an organization spend on this kind of project? Knowing the strengths and weaknesses of each partner, should we work with or against them? In fact, the whole philosophy of the project could be reduced to the slogan: Get out of your comfort zone! Because it is only in the “risk zone” where both artists and scientists can pass through the most unexpected experiences and find new ways of thinking about conflict and cooperation. Idiomatic/Dub it: One Voice, Many Languages, a tongue-twisting entertainment on the tip of one’s tongue, turning on mother tongues and other tongues in a post-babel performance that got lost in google translate: innovation in captioning for performing arts. this multilingual, transnational project identifies translation via new technology as key to expand audiences and increase intercultural dialogue. It uses the research phase to find new ways to develop translation aids with digital technology. Theatre Series “Tale Of The Century”: How Do You Trace The History of the Nation?